85 Marlborough is located on the north side of Marlborough, between Berkeley and Clarendon, with 83 Marlborough to the east and 87 Marlborough to the west. 85 Marlborough was built ca. 1864 for shipping merchant and real estate investor John Lowell Gardner, one of nine contiguous houses (71-73-75-77-79-81-83-85-87 Marlborough) he had built as rental property. He and his wife, Catharine Elizabeth (Peabody) Gardner, lived at 7 Beacon and then at 182 Beacon. 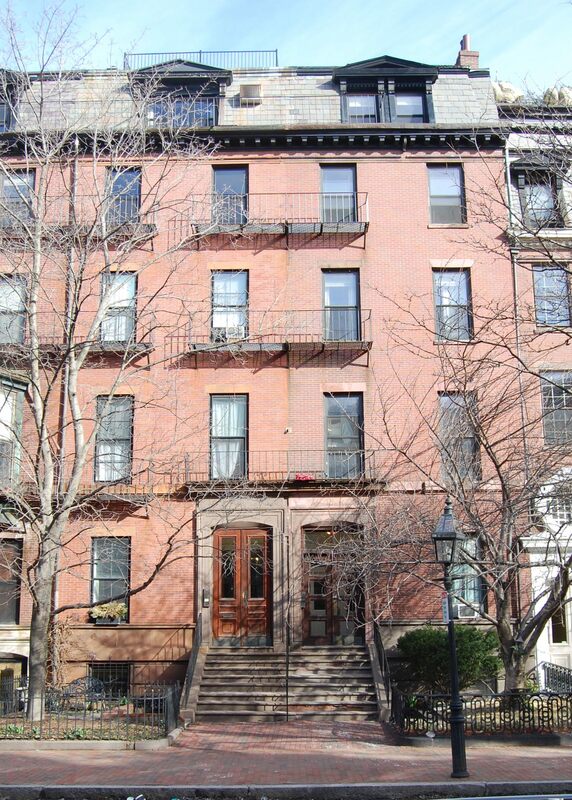 Click here for an index to the deeds for 85 Marlborough. By mid-1865, 85 Marlborough was the home of Edward Reynolds Andrews and his wife, Sarah Hannah (Addoms) Andrews. They also maintained a home in West Roxbury, on a 100-acre farm, Home Farm, he had purchased in the mid-1850s. In 1866, the Andrewses moved to Paris, where he became a banker. They returned to Boston in the mid-1880s to found a company, Andrews & Co., which introduced improved methods of creosoting timber. During the 1886-1887 winter season, they lived at 265 Beacon. By 1867, 85 Marlborough was the home of John Haldane Flagler and his wife, Anna Harper (Converse) Flagler. They previously had lived at the Revere House hotel. John Haldane Flagler was a manufacturer of boiler iron and tubing. He founded the National Tube Company and served as its president until it merged with United States Steel. The Flaglers continued to live at 85 Marlborough until 1870. By mid-1870, 85 Marlborough was the home of furrier Henry Pazolt and his wife, Josephine (Reggio) Pazolt. They previously had lived at 130 Warre. 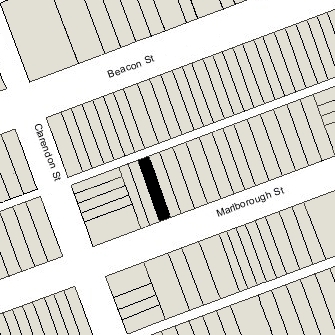 They continued to live at 85 Marlborough in 1871, but by 1872 had moved to Newton. By 1872, 85 Marlborough was the home of attorney Edward Jackson Holmes and his wife, Henrietta Goddard (Wigglesworth) Holmes. They had married in October of 1871 and 85 Marlborough probably was their first home together. 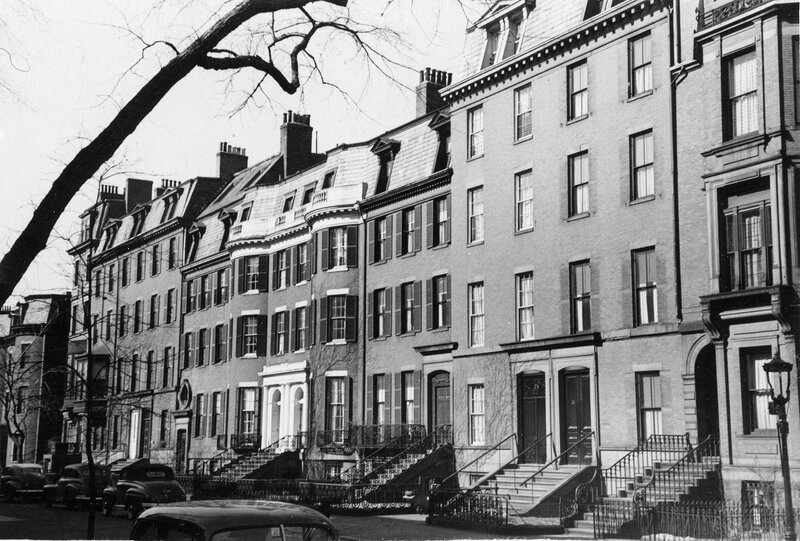 Prior to their marriage, he had served as private secretary to US Senator Charles Sumner in Washington DC; in Boston, he had lived with his parents, Dr. Oliver Wendell Holmes and Amelia Lee (Jackson) Holmes, at 164 Charles and then probably at 296 Beacon. Edward and Henrietta Holmes continued to live at 85 Marlborough until 1877, when they left for an extended trip abroad. 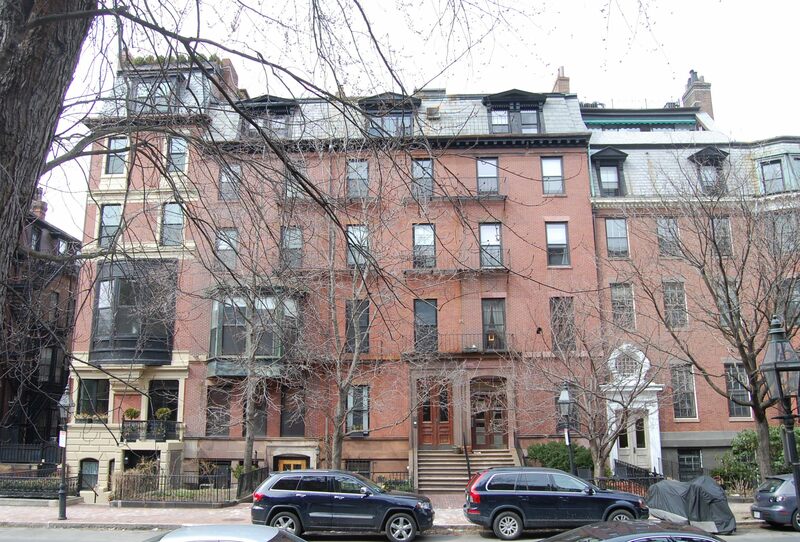 85 Marlborough was listed as vacant in the 1878 Blue Book. By the 1878-1879 winter season, it was the home of George Harrison Mifflin and his wife, Jane Appleton (Phillips) Mifflin. They had married in October of 1878 and 85 Marlborough probably was their first home together. Prior to their marriage, he had lived at 260 Beacon with his parents, Dr. Charles Mifflin and Mary (Crowninshield) Mifflin. George Mifflin was a partner in the publishing firm of Houghton, Osgood & Co. In the 1870s, the firm (previously Hurd and Houghton) had acquired the Atlantic Monthly magazine and the Ticknor & Fields publishing company. In 1895, the founder, Henry Oscar Houghton, died, and control of the firm passed to George Mifflin. In 1908, it was incorporated as Houghton Mifflin Company. On February 26, 1907, George Mifflin purchased 85 Marlborough from Joseph Peabody Gardner, Jr., William Amory Gardner, and Augustus P. Gardner. George Mifflin died in April of 1921. Jane Mifflin continued to live there with their son, George Harrison Mifflin, Jr. He was unmarried. During the 1922-1923 winter season, they were living elsewhere and 85 Marlborough was the home of attorney Henry Eldridge Warner and his wife, Henrietta (Slade) Warner. Their primary residence was in Lincoln. By the next season, they had moved to 68 Marlborough. 85 Marlborough was not listed in the 1924 Blue Book. By the 1924-1925 winter season, Jane Mifflin and George Mifflin, Jr., were living at 85 Marlborough once again. They also maintained a residence in Nahant and later in North Andover. Jane Mifflin died in November of 1935. George Mifflin, Jr., continued to live at 85 Marlborough until about 1937. The house was shown as vacant in the 1938 and 1939 City Directories. In September of 1939, Augustus P. Loring, guardian for George Mifflin, Jr., filed to change the occupancy from a single-family dwelling into a school for medical secretaries. 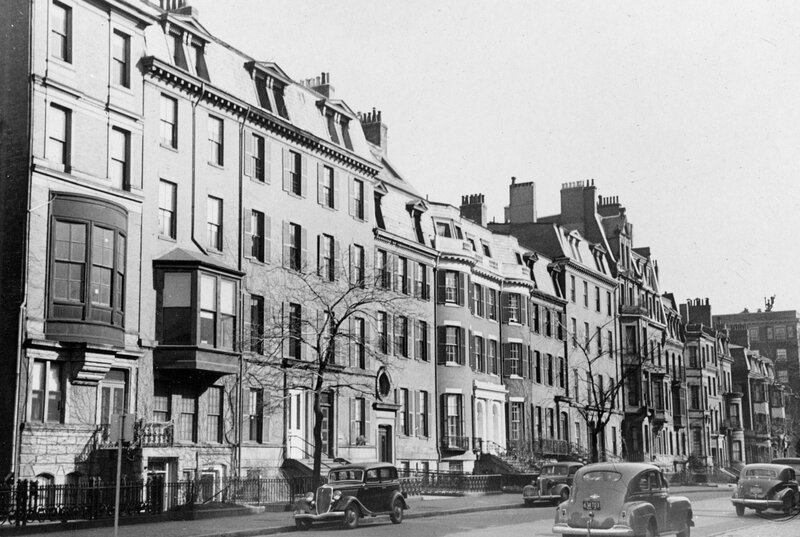 The Board of Appeal approved the change in occupancy, noting that 85 Marlborough was “a fine, old-fashioned single-family residence of second-class construction” that has “out-lived its usefulness,” and that allowing a school, while “technically … a violation of the letter of the law” would not “conflict with the spirit” of the law, which allowed “educational, religious, philanthropic, or other institutional uses” in a residential district. By 1941, 85 Marlborough had become the Wyndham School, founded by Edward James O’Callahan and his wife, Helen (Gately) O’Callahan. They lived in Cambridge and later in Brookline. In addition to serving as the school’s director, he also was an actor and was a founder of the Poet’s Theater in Cambridge. On September 30, 1954, the O’Callahans purchased 85 Marlborough from Augustus P. Loring and John G. Brooks, guardians of George Harrison Mifflin. Wyndham School continued to be located at 85 Marlborough until the early 1970s. In April of 1973, Edward J. O’Callahan applied for (and subsequently received) permission to convert the house from a school into eight apartments. On June 11, 1973, 85 Marlborough was purchased from the O’Callahans by Eugene Sears Summers, Anthony Sears Summers, and Stephen R. Ross, trustees of the 85 Trust. On September 30, 1974, 85 Marlborough was acquired from the 85 Trust by David Sullivan, and on April 5, 1979, it was acquired from him by Mary W. Sullivan as trustee of the 85 Marlborough Realty Street Trust. 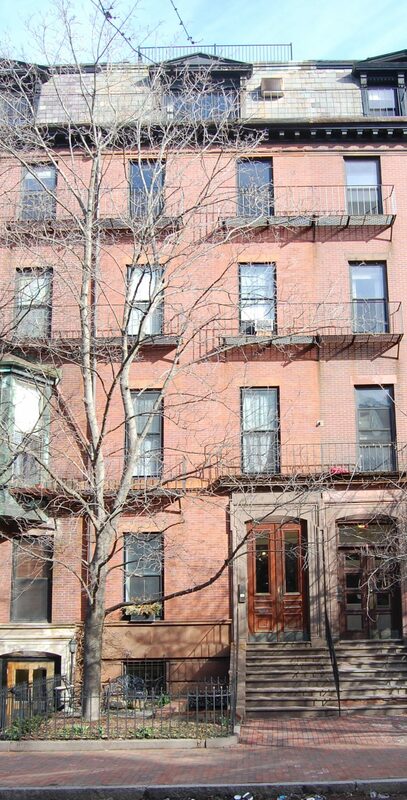 On October 15, 1979, Mary W. Sullivan converted the property into eight condominium units, the 85 Marlborough Street Condominium..